Alina and Mal are on the run. Hunted and haunted, but together at last, they can’t outrun Alina’s past or her destiny forever. The Darkling has emerged from the Shadow Fold with a terrifying new power and he needs Alina to realise his dangerous plan. There are others who would like to use Alina’s gift too. And as her power grows, somehow, she must choose between her country, her power, and her love – or risk losing everything to the oncoming storm. 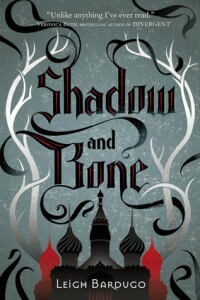 Please note: This is a review for the second book in the Grisha series, and so contains spoilers for the first in the series, Shadow and Bone (Published in Australia and the UK as The Gathering Dark). You may wish to read my review for that book instead! I really enjoyed reading The Gathering Dark at the start of this year so I was keen to get a copy of Siege and Storm as soon as it was released. Unfortunately, my original copy didn’t quite make it to me even after a month, but the lovely folks at The Book Depository sent me another copy! I was so happy that I had got a hard copy in the end, because this little blog is one of many mentioned as helping with the promotion of The Gathering Dark. Thanks, and you’re welcome! Anyway, to the book. As second books go, this one delivered plenty of action right from the first page. Alina and Mal are heading off to make a life for themselves on the other side of the Unsea away from Ravka and the Darkling. Before they get far though, they meet up with a charming but eccentric privateer called Sturmhond, and are back in the Darkling’s clutches once again. Alina must come to terms with her powers if she is to unite the remaining Grisha and defeat the Darkling. I have to say, I loved Sturmhond. It’s always fun when a new and lovable character is introduced in a sequel, and Sturmhond fits into the story perfectly. I’ll admit to thinking he was a little too Captain Jack Sparrow early on, but later… well, I loved him. Alina and Mal’s relationship develops in interesting ways and while Alina struggles to be the leader she doesn’t want to be, Mal is also struggling to keep his place in her world. Their story is breaking my heart! I did want to give Alina a stern talking to when she starts thinking she’s losing her mind, but doesn’t actually tell anyone about it! Apart from that she is a very strong character, who I feel can only develop into a great leader in the next part of the story. I can’t help wondering what has been going on with the Darkling all the way through this book – he was such a major part of The Gathering Dark but for most of Siege and Storm, he’s absent. I guess this is the price paid for having Alina’s as the sole point of view. The pace slows a little through the middle as the group are journeying back to Os Alta, but once they’re there it’s all action. And yes, there is another huge cliff-hanger ending. 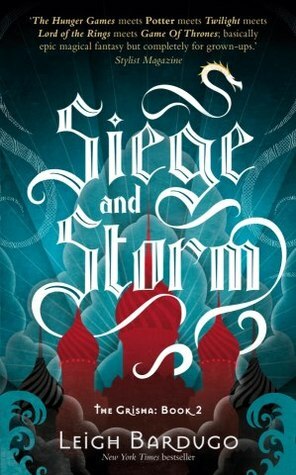 Siege and Storm was an enjoyable middle instalment in this series with some very funny as well as some rather epic moments. 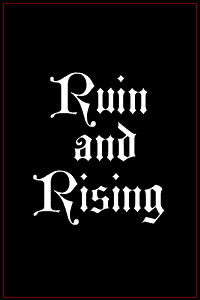 Bring on Ruin and Rising! What did others think of Siege and Storm? I’m one of those readers who had a mixed reading experience with Shadow and Bone. I felt as if Mal came up short in terms of coming into his own, and Bardugo relied heavily on his relationship with Alina for his characterization. I am interested to see how he has evolved as a character. Perhaps I need to do a reread of Shadow and Bone first. Just to make sure my first assessment of Mal was correct. Still, from what I remember, Mal didn’t live up to much for me – which makes me sad to say, because I know this series is a favorite among bloggers! 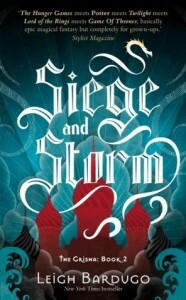 Do you think Siege and Storm can convert me into a lover of this series? I will say, I am curious about meeting Sturmhond. I think he can be exactly what I’ve been wanting from this series. But I’m not sure if this character alone is enough. It does, doesn’t it 😀 Based on the ending of this one, the third promises to be epic!